The Democratic Party may stand to gain from an infusion of young up-and-coming political hopefuls, but US Sen. Elizabeth Warren is not picking a side just yet in the race for Massachusetts’s 7th Congressional District, where Boston City Councillor at-Large Ayanna Pressley is making a run to unseat US Rep. Michael Capuano. That dichotomy is playing out in the 7th race. Pressley, 43, appears ready to make a generational case for running against the 66-year-old Capuano, who has held the seat since first elected in 1998. The two progressive Democrats — a rising star of the party facing off against a 10-term congressman — maintain few differences in policy positions at this stage of the contest. The contest has sparked a conversation about ambitious younger candidates balking at the entrenched wait-your-turn mentality for seeking office, especially in districts where voters have generally favorable views toward their longtime representatives. 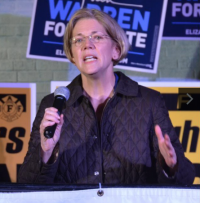 On Monday, Warren said she regards both politicians as friends and valuable allies in government. On Tuesday evening, Pressley attended the Ward 16 Democratic caucus at the McKeon Post in Neponset to make her case to some of the neighborhood’s most active party loyalists. “I’m very encouraged that I think we’ve set a tonality early on that we’re going to run a positive campaign, and so, the reception has been warm,” Pressley told the Reporter before the caucus began. She plans to officially launch her campaign next Tuesday, Feb. 13. Barbara Capuano, the congressman’s wife, was also at the caucus and addressed the room on behalf of her husband, who was in Washington.